There are 17 Assisted Living Facilities in the Granger area, with 3 in Granger and 14 nearby. The average cost of assisted living in Granger is $3,290 per month. This is lower than the national median of $3,346. Cheaper nearby regions include Mishawaka with an average starting cost of $2,613. To help you with your search, browse the 101 reviews below for assisted living facilities in Granger. On average, consumers rate assisted living in Granger 4.5 out of 5 stars. Better rated regions include Michigan City with an average rating of 4.6 out of 5 stars. Caring.com has helped thousands of families find high-quality senior care. To speak with one of our Family Advisors about assisted living options and costs in Granger, call (855) 863-8283. Waived processing fees. Terms and conditions apply. Granger sits on the Indiana-Michigan border and is less than an hour from Lake Michigan. The city boasts a sizable senior population, with more than 14 percent of Granger's 30,465 residents aged 65 or older. These seniors have access to three assisted living facilities in Granger, with another 14 in nearby cities such as South Bend and Mishawaka. These assisted living facilities earn licensing from the Indiana State Department of Health's Residential Care Facility Licensing Program. This oversight ensures that these facilities deliver optimal care to seniors in Granger and the rest of the state. Cost of living in Granger is just above average. It ranks 102.2, compared to the U.S. average of 100. Housing is even higher than average at 129. However, healthcare costs are lower at 80. Seniors' families may want to consider these costs when budgeting for memory care facilities. Seniors in Granger living on social security will be happy knowing that the state doesn't tax this income. However, other types of retirement income, such as pensions and 401(k)s are subject to taxation. Seniors' families can rest easy knowing that crime rates are low in Granger. Violent crime rates rank 17.9, compared to a national average of 31.1. Property crime rates across the U.S. average 38.1, but Granger's property crime rate is just 15.6. Snow is the defining feature of Granger's climate. The area sees 62 inches of snow annually and faces winter low temperatures in the teens. Summers warm to the low 80s. Additionally, Granger sees an average amount of rainfall but fewer sunny days than the U.S. average. Granger has few facilities from which to choose in the event of a medical emergency or illness, with the nearest major hospital located in South Bend. The Granger area has poor air quality, according to the American Lung Association. This region ranks 36th nationally for high ozone days and 17th nationally for 24-hour particle pollution. Seniors with respiratory issues may want to keep this in mind when considering the area. Assisted Living costs in Granger start around $3,252 per month on average, while the nationwide average cost of assisted living is $4,000 per month, according to the latest figures from Genworth’s Cost of Care Survey. It’s important to note that assisted living rates in Granger and the surrounding suburbs can vary widely based on factors such as location, the level of care needed, apartment size and the types of amenities offered at each community. 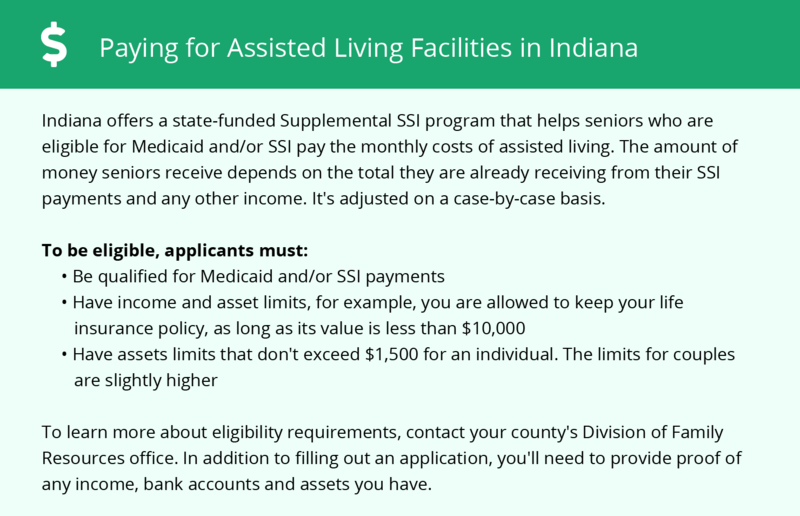 Indiana's Residential Care Assistance Program can help seniors pay for assisted living expenses. This program is for seniors who can no longer live alone but do not require around-the-clock nursing home care. This supplemental program is based on income. 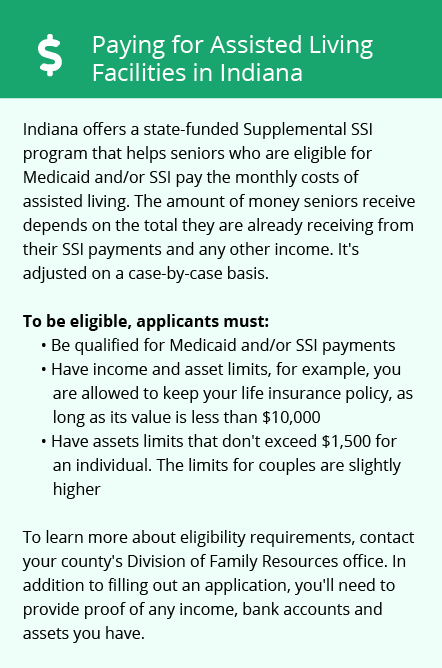 Eligible participants must be 65 years old, living in an assisted living facility and receiving Medicaid or participating in the Supplementary Security Income program. Granger and the surrounding area are home to numerous government agencies and non-profit organizations offering help for seniors searching for or currently residing in an assisted living community. These organizations can also provide assistance in a number of other eldercare services such as geriatric care management, elder law advice, estate planning, finding home care and health and wellness programs. To see a list of free assisted living resources in Granger, please visit our Assisted Living in Indiana page. Granger-area assisted living communities must adhere to the comprehensive set of state laws and regulations that all assisted living communities in Indiana are required to follow. Visit our Assisted Living in Indiana page for more information about these laws.